A decade ago we could only dream about a RADAR which could tell us which ‘dudes to date’ nearby. But today we have it! Following my last blog about how we used to calculate your location, I’d like to explain how RADAR works. When a new Romeo joins our community, we ask them to pinpoint their location on a map. When they do, Google Maps sends us a GeoCoordinate which we connect to the PlanetRomeo structure of cities and city districts. When you’re choosing a new location, you can give it a name that makes more sense for you, such as ‘Home’ or ‘Gym’? This name will be displayed in your profile, helping you let other Romeos know where you are. At last count, our Romeos had saved 6.7 million different locations in our database. That means an average of 2.7 locations per profile, in addition to your GPS locations. So it looks like you get around! We are one of the few gay dating sites that have a RADAR function both in the desktop version as well as the App. When using the App, you can either set a location manually or use your phone to calculate your position based on the global positioning system (GPS). When you refresh the App, your GPS position updates automatically. Our job is to exchange all the location info between App and desktop version. And both work with different techniques. A challenge for our developers, but we figured it out! Our Tech Team is on it! If you’re using our app and choose ‘GPS-Position’ in the ‘Where can I be found’ setting, you are also allocated to a region in the PlanetRomeo world automatically by our system. Each city is marked with a single GeoCoordinate, so to say: a point on the map. If you’re on the border of your city, you might be closer to the city center of the neighboring city than the city you’re actually in. This especially happens if you’re living at the suburbs of a big city in a densely populated area. 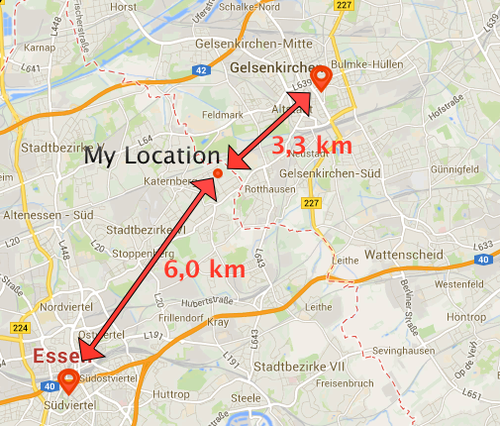 For example: On the map above you see a marked location, which is in Essen, Germany. But since it’s closer to the center of Gelsenkirchen than to the center of Essen, it’s automatically assigned to Gelsenkirchen when you’re using the App. This is why in some cases Romeos appear in another city for desktop users. Just a limitation of the technique, but we’re working on it! We’re always trying to be on top of these developments in order to improve our features. If there were no technical limits, what futuristic features would you like to see on our platform in 2050? Let your imagination run wild and share it below!